To date, more than 90 individuals with FOXG1 mutations have been described, mostly within small case series.5,7 The disorder comprises a complex constellation of clinical features, including severe postnatal microcephaly, deficient social reciprocity, combined stereotypies and dyskinesias, epilepsy, poor sleep patterns, and unexplained episodes of crying.3 In parallel to these clinical criteria, the importance of brain MRI features has been emphasized.1,3,8 However, the spectrum of MRI features in FOXG1 syndrome is yet to be fully defined. In light of these recent findings, the aim of this study was to provide a comprehensive overview of FOXG1-related clinical and imaging phenotypes by thorough analysis of a cohort of 45 clinically well-characterized patients with FOXG1 mutation and refine the phenotype-genotype correlation in FOXG1 syndrome. We recruited patients with pathogenic or likely pathogenic FOXG1 mutations from different cohorts through a large national and international network. Genetic testing was performed by array comparative genomic hybridization (CGH) (5/45), Sanger sequencing (31/45), targeted panel high-throughput sequencing (4/45), and whole-exome sequencing (4/45). The study was approved by the ethics committee of the University Hospital of Necker Enfants Malades, Paris, France and the relevant local institutional review boards. Parental written informed consent was obtained for all affected patients. All patients were personally known to at least 1 of the co-authors and were reexamined for the purpose of the study. Five patients had been reported previously and were reassessed for the study.8,11,12 Standardized clinical information was recorded. Movement disorders were characterized in person by investigators and classified according to established criteria.13 Epileptic seizures were classified according to the recommendations of the Commission on Classification and Terminology of the International League Against Epilepsy. In addition, for patients filmed, we obtained additional authorization for disclosure of any recognizable persons in videos. The genetic testings were performed in accordance with the respective national ethics guidelines and approved by the local authorities in the participating study centers. As the MRI studies were performed over a period of 10 years at many different imaging centers and on many different types of MR scanners, the imaging techniques that were used differed substantially, although a majority had at least axial and sagittal T1-weighted and axial T2-weighted and fluid-attenuated inversion recovery (FLAIR) sequences. Imaging assessment was based on agreement between 2 investigators (N.B. and N.B.-B.) who reviewed the images. Each made initial evaluations independently, and any disagreements regarding the final conclusion were resolved by consensus. All statistical analyses were performed in GraphPad Prism version 6.00. Data are described as mean ± SEM. Differences were evaluated using the 2-way analysis of variance with multiple comparison tests. Our cohort totaled 45 patients with FOXG1 mutations, 22 males and 23 females ranging in age from 19 months to 42 years (median: 5.73 years) at the time of evaluation (table e-1 links.lww.com/NXG/A97). A total of 37 FOXG1 different heterozygous mutations were identified, of which 18 are novel. They comprised 32 small intragenic mutations and 5 large deletions of the whole FOXG1 locus. All mutations were de novo, except 1 reported previously as a germinal mosaic.12 Point mutations were mostly frameshifts (14/32; 43.75%) and missense mutations (12/32; 37.5%), with a small number of nonsense (4/32; 12.5%) and in-frame mutations (2/32; 6.25%) (figure 1, A and B). Three recurrent mutations, c.460dupG, c.256dupC, and c.256delC, were identified. Patients first came to medical attention at a median age of 3 months (birth to 20 months) because of developmental delay and microcephaly (15/45; 33.3%) or with lack of eye contact, or strabismus (16/45; 35.6%). Epileptic seizures or movement disorder were less common (4/45; <10%). In 5 cases (11.1%), brain anomalies were diagnosed prenatally. At birth, a majority of patients had normal body measurements and low normal birth head size (38/43; 88.4%). Severe postnatal microcephaly (−4 to −6 SD) became apparent after the age of 1 month. At the age of the last evaluation (median: 5 years; 19 months to 42 years), all patients had profound developmental delay, with permanent esotropia (38/42; 90.7%) (video 1 links.lww.com/NXG/A99). Hand use was severely limited to involuntary gross manipulation (13/44; 29.5%) (video 2 links.lww.com/NXG/A100). On examination, a complex movement disorder was the most prominent feature characterized by generalized hyperkinetic and dyskinetic movements that was present at rest and worsened with attempts to movement (videos 3 and video 4 links.lww.com/NXG/A101 and links.lww.com/NXG/A102), with orolingual dyskinesias (12/33; 36.4%) (video 5 links.lww.com/NXG/A103); 34 of 43 patients (79.1%) also showed hand stereotypies, consisting of hand pressing/wringing or hand mouthing (videos 6 and video 7 links.lww.com/NXG/A104, links.lww.com/NXG/A105), which are unusual in the context of dyskinetic movement disorders. Thirty-two of 44 patients (72.7%) had feeding difficulties associated with gastroesophageal reflux (videos 8 and video 9 links.lww.com/NXG/A106 and links.lww.com/NXG/A107). Sleep problems were frequent (27/42; 64.3%) and included multiple nocturnal awakenings or difficulties in falling asleep with irritability and inconsolable crying or inappropriate laughing (25/40; 62.5%). Seizures were documented in 77.8% (35/45) of patients and occurred at a mean age of 2.5 years (range: 2 days to 12 years). Generalized tonic or tonic-clonic seizures were the most frequent seizure type (21/35; 60%). Of the 35 patients, 17 (48.6%) developed refractory epilepsy with multiple seizure types and 5 (14.3%) experienced at least 1 episode of status epilepticus (table 1). Because, FOXG1 mutations had been previously associated with congenital Rett variant, we examined the prevalence of congenital Rett-supportive manifestations. Overall, 2 of 21 females (9.5%) and 1 of 21 males (4.76%) fulfilled the diagnostic criteria for Rett syndrome14 (table e-2 links.lww.com/NXG/A98). Patients with FOXG1 syndrome showed a variable degree of gyration, moderate-to-severe myelination delay or white matter loss (64.4%), and abnormal corpus callosum (95.6%). From our detailed review of these imaging studies, we were able to delineate 3 groups of severity of gyration defect that are most easily appreciated with multiple views in several planes, as shown in figures 2, A-L and 3, A-H. The first gyral pattern, the most severe, consisted of pachygyria, with thickened cortex with frontal lobe predominance (12/45; 26.7%). This pattern was seen in the youngest patients (mean age 1.8 years) and was accentuated by the underdevelopment of the frontal lobes and the reduced volume of the subcortical white matter. In this group, myelination delay was prominent, ranging from severe (7/11; 63.6%) to moderately delayed (4/11; 36.4%). The most common corpus callosum anomaly was anterior hypogenesis, mostly affecting the genu and the rostrum (6/11; 54.5%) (figure 2, A-L). Sequential MRI performed during the first years of life showed that this pachygyric appearance can be overestimated between the ages of 12 and 24 months because of the immature myelination (figure 3, A-H). Delayed myelination improved with age, and no case of hypomyelination or dysmyelination was observed after the age of 5 years. The second gyral pattern of intermediate severity met the subjective criteria of moderately simplified gyral pattern.15 This pattern was observed in 24.4% (11/45) of patients with mean age of 3.1 years. In this group, myelination was moderately to severely delayed. The corpus callosum showed a wide range of anomalies, including complete agenesis (5/11; 45.5%), global hypoplasia (3/11; 27.3%), and anterior hypogenesis (3/11; 27.3%). The third gyral pattern, the least severe, consisted of mildly simplified to normal gyral pattern. These patients (22/45; 48.9%) were older than the 2 previous groups (mean age 6.1 years). White matter anomalies were mostly mild or absent (14/22; 63.6%), and the corpus callosum was hypogenetic in its anterior part in the majority of cases (14/22; 63.6%) (figure e-1 links.lww.com/NXG/A91). To assess genotype-phenotype associations in FOXG1 syndrome, we investigated the correlation between the score of selected FOXG1 criteria in the whole cohort and 5 genetic subgroups (e-results) (table 2). Patients with N-terminal mutations and FOXG1 deletions showed the highest global severity scores, while those with FBD frameshift and nonsense mutations showed the lowest global severity scores (p < 0.05). Patients with FBD missense and C-terminal domain mutations tended to have lower global severity scores, although the differences were not significant because of the small size of these groups (figure e-2A links.lww.com/NXG/A92). When covariance analysis was performed in the whole cohort, we found significant positive covariance of gyral and myelination pattern scores, suggesting that whatever the type of FOXG1 mutation, the most severe cortical anomaly (i.e., pachygyria) is correlated with the most severe myelination delay, further reinforcing the fact that this cortical anomaly may be overestimated because of the abnormal myelination of the subcortical fibers. Further analyses showed significant and distinct covariance relationships in which the MRI pattern appeared the most relevant criteria in distinguishing the genetic groups (figures e-3 links.lww.com/NXG/A93 and e-4 links.lww.com/NXG/A94). Interesting data also came from the analysis of patients with recurrent frameshift mutations c.460dupG and c.256dupC. Remarkably, among the patients with c.460dupG, we found significant differences in clinical and imaging presentations, demonstrating that genotype-phenotype correlation is not straightforward in FOXG1 syndrome. 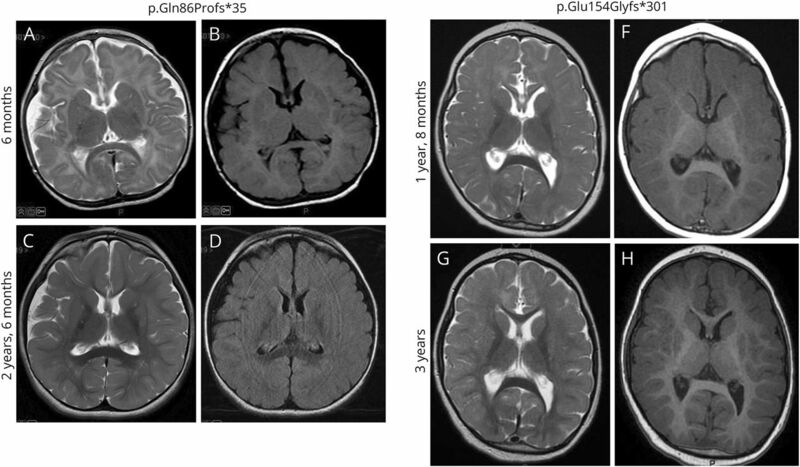 On MRI, this mutation resulted in a spectrum of corpus callosum anomalies, from complete agenesis to global hypoplasia (figure e-5 links.lww.com/NXG/A96). By contrast, the 3 patients with the c.256dupC had a more consistent phenotype. A previous report suggested that FOXG1 syndrome could be classified as an epileptic-dyskinetic encephalopathy18 like ARX- and STXBP1-related encephalopathies. Our data show that epilepsy is not a consistent feature, unlike dyskinetic-hyperkinetic movements. Although epilepsy affected 79% of patients reported here, which is within the range of previous reports (from 57%7 to 86%5), it did not show a particular seizure pattern that could help the clinician to define a specific epilepsy syndrome. Since the first report that FOXG1 mutations can be responsible for congenital Rett variant, a number of publications have emphasized the differences between these disorders.33 Here, by applying the congenital Rett variant criteria,14 we confirm that the majority of patients with the FOXG1 syndrome do not meet the criteria for congenital Rett variant. At all ages, FOXG1 syndrome is more severe with respect to ambulation, reciprocity, and receptive language and has more disordered sleep, compared with Rett syndrome, as well as lacking the regression observed in Rett syndrome. These findings further reinforce that FOXG1 disorder is clinically separable from Rett syndrome, with distinct clinical presentation and natural history. It is important that patients with FOXG1 disorder receive appropriate counseling about medical comorbidities and natural history related to their disorder, avoiding the confusion with Rett syndrome. The number of reported FOXG1 mutations is now large enough to search for genotype-phenotype correlations in FOXG1 syndrome. We observed that patients carrying mutations in the N-terminal domain and large deletion of FOXG1, which are the most common mutation types, show the most severe presentation and MRI anomalies, while those carrying mutations in the FBD or C-terminal domain were less severely affected. In previous series, a milder phenotype was observed in patients with missense variants in the FBD conserved site.7 However, the differences were found in items related to sitting, walking, and functional hand use, which are commonly severely impaired in all FOXG1 mutation patients.7 Using covariance and cluster analyses, we highlighted relationships between gyral and myelination patterns in patients with FOXG1 disorder. However, identical hotspot mutations c.256dupC and c.406dupG can be associated with highly variable features, such as variable epilepsy severity or degree of corpus callosum anomalies, underlining the importance of being cautious about predicting phenotype on the basis of genotype in the context of genetic counseling. This suggests that factors beyond the primary mutation can influence disease severity, including genetic modifiers and epigenetic and environmental factors. The complexity and the poor reproducibility of genotype-phenotype relationships in FOXG1 syndrome probably reflects the pleiotropic and nonredundant roles of Foxg1 in vertebrate brain development. This study, one of the largest to date, provides evidence that FOXG1 mutations are responsible for a specific and recognizable neurodevelopmental disorder with a high degree of variability. We have expanded the phenotypic spectrum by defining 3 key brain imaging features of FOXG1 syndrome, noting that the degree of cortical abnormality is not correlated with the severity of the corpus callosum malformation. Moreover, our data confirm that mutations leading to the loss of the FBD domain, lead to the most severe clinical presentation of FOXG1 syndrome. The pathophysiology of such complex genotype-phenotype relationships reflects the pleiotropic and nonredundant roles of Foxg1 during development. From the Imagine Institute (N.V., M.C., C. Maillard, A.B., N.B.-B. ), INSERM UMR 1163, Paris Descartes University, Necker Enfants Malades Hospital, Paris, France; Pediatric Neurology APHP—Necker Enfants Malades Hospital (M.C., M.H., N.B.-B. ), Paris, France; Pediatric Radiology (N.B. ), APHP—Necker Enfants Malades Hospital, Paris, France; Image—Imagine Institute (N.B. ), INSERM UMR 1163, Paris Descartes University, Necker Enfants Malades Hospital, Paris, France; Department of Paediatric Clinical Epileptology (J.T. ), Sleep Disorders and Functional Neurology, University Hospitals of Lyon (HCL), France; Service de Génétique médicale (E.S. ), Hôpitaux Universitaires de Strasbourg, IGMA, France; Pediatric Neurology (T.L.-S.), Wolfson Medical Center, Tel Aviv, Israël; Wolfson Molecular Genetics Laboratory (D.L. ), Wolfson Medical Center, Tel Aviv, Israël; Neurometabolism Department (B.M. ), Angers Hospital and University, France; Centre de Génétique et Centre de Référence Maladies Rares Anomalies du Développement (S.M., A.M.), CHU Dijon, France; South Australian Clinical Genetics Service (E.H.), SA Pathology (at Royal Adelaide Hospital), and School of Medicine, University of Adelaide, Australia; Service de Génétique Médicale (B.I., M.N., M.V., B.C. ), CHU Nantes, France; Département de Génétique et Centre de Référence Déficiences Intellectuelles de Causes Rares (D.H., C. Mignot), Hôpital de la Pitié-Salpêtrière, APHP, Paris, France; GMGF (M.M. ), INSERM UMR_S910, Aix-Marseille University, Pediatric Neurology Unit, Timone Children Hospital, Marseille, France; Department of Neonatal Medicine (S.R. ), Rouen University Hospital, Haute-Normandie, France; Department of Medical Genetics (C. Michot), Reference Center for Skeletal Dysplasia, INSERM UMR 1163, Laboratory of Molecular and Physiopathological Bases of Osteochondrodysplasia, Paris Descartes-Sorbonne Paris Cité University, AP-HP, Institut Imagine, and Hôpital Universitaire Necker-Enfants Malades, Paris, France; APHP (S.V. ), GHUEP, Hôpital Trousseau, Neurologie Pédiatrique, Paris, France; GRC ConCer-LD (S.V. ), Sorbonne Universités, UPMC Univ 06, Paris, France; Hôpital Nord Franche Comte (S.W. ), CH HNFC—Site de Belfort, France; Pediatrics (A.D.), University of Basel Childrens' Hospital, Switzerland; CHU Rennes (S.O. ), Service de Génétique Clinique, CNRS UMR6290, Université Rennes1, France; Service de Pédiatrie (L.L. ), Centre Hospitalier de la Côte Basque, Bayonne, France; Department of Genetics (G.A.M. ), Rouen University Hospital, France; Service de Génétique (A.S.), Hôpital Bretonneau, Tours, France; Service de Neurologie Pédiatrique (J.M.P. ), Hôpital Pellegrin-Enfants, CHU de Bordeaux, France; Pédiatrie générale (I.C. ), Hôpital de Lorient, France; Génétique Médicale—CHU Estaing CLERMONT-FERRAND (B.P., B.T. ), France; Service de Neurologie Pédiatrique (F.R. ), Hôpital Gui de Chauliac, CHRU de Montpellier, France; Equipe Génétique des Anomalies du Développement (C.P. ), INSERM UMR1231, Université de Bourgogne-Franche Comté, Dijon, France; Laboratoire de Génétique chromosomique moléculaire (C.P. ), Plateau technique de Biologie, CHU, Dijon, France; Laboratory of Biochemistry and Molecular Genetics (T.B. ), HUPC Paris Centre, Cochin Hospital, Paris, France; National Rare Disease Center—Centre de Référence “déficiences intellectuelles de causes rares” (M.-A.S.), Strasbourg University Hospital, France; and National Rare Disease Center—Centre de Référence “déficiences intellectuelles de causes rares” (N.B.-B. ), AP-HP, Necker Enfants Malades, Paris, France. N. Vegas, M. Cavallin, C. Maillard: study concept and design, analysis and acquisition of clinical and molecular data. N. Boddaert: analysis and acquisition of MRI data. J. Toulouse, E. Schaefer, T. Lerman-Sagie, D. Lev, B. Magalie, S. Moutton, E. Haan, B. Isidor, D. Heron, M. Milh, S. Rondeau, C. Michot, S. Valence, S. Wagner, M. Hully, C. Mignot, A. Masurel, A. Datta, S. Odent, M. Nizon, L. Lazaro, M. Vincent, B. Cogné, G.A. Marie, A. Stéphanie, J.M. Pedespan, I. Caubel, B. Pontier, B. Troude, F. Rivier, M.-A. Spitz: acquisition of data and follow-up of the patients. C. Philippe and T. Bienvenu: analysis molecular data. A. Bery and N. Bahi-Buisson: study supervision, concept and critical revision of manuscript for intellectual content. Research reported in this publication was supported by the Agence Nationale de la Recherche (ANR-16-CE16-0011 MC, AB, NBB), the Fondation Maladies Rares, and DESIRE (grant agreement 602531). The project was also supported by the European Network on Brain Malformations (COST Action CA16118). The authors have no conflict of interest to declare. N. Vegas, M. Cavallin, C. Maillard, N. Boddaert, J. Toulouse, E. Schaefer report no disclosures. T. Lerman-Sagie has served on the editorial boards of the Journal of Child Neurology, Harefuah, and the European Journal of Paediatric Neurology. D. Lev has received research support from the Sackler School of Medicine (Tel Aviv University). M. Barth and S. Moutton report no disclosures. E. Haan has received research support from the Lipedema Foundation (USA). B. Isidor and D. Heron report no disclosures. M. Milh has received speaker honoraria from Shire and Cyberonics. S. Rondeau, C. Michot, S. Valence, S. Wagner, M. Hully, C. Mignot, A. Masurel, A. Datta, S. Odent, M. Nizon, L. Lazaro, M. Vincent, B. Cogné, A.M. Guerrot, S. Arpin, J.M. Pedespan, I. Caubel, B. Pontier, B. Troude, F. Rivier, C. Philippe, T. Bienvenu, M. Spitz, and A. Bery report no disclosures. N. Bahi-Buisson has received research support from Agence Nationale de la recherche, Fondation pour la Recherche Médicale, Fondation NRJ—Institut de France, and the EU-FP7 project GENECODYS. Full disclosure form information provided by the authors is available with the full text of this article at Neurology.org/NG. The authors would like to thank the affected individuals and their families for participation in this study, as well as the clinicians in charge of these patients who may not be cited. The authors would like to sincerely thank Prof Alessandra Pierani for her critical reading of the manuscript and helpful comments on our findings.
. 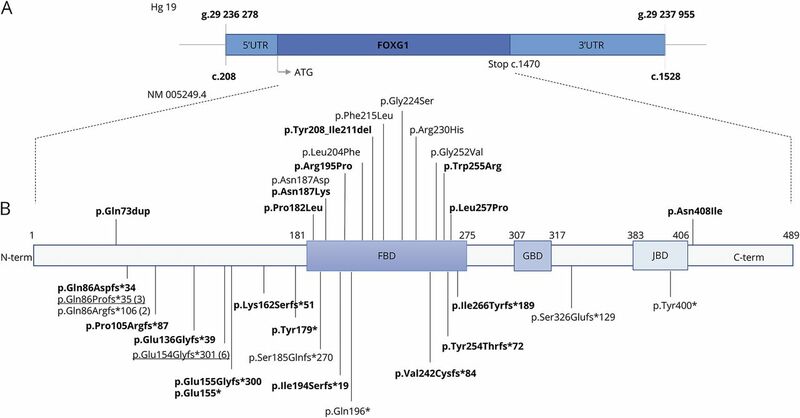 Novel FOXG1 mutations associated with the congenital variant of Rett syndrome. J Med Genet 2010;47:49–53.
. The core FOXG1 syndrome phenotype consists of postnatal microcephaly, severe mental retardation, absent language, dyskinesia, and corpus callosum hypogenesis. J Med Genet 2011;48:396–406.
. 14q12 Microdeletions excluding FOXG1 give rise to a congenital variant Rett syndrome-like phenotype. Eur J Hum Genet 2013;21:522–527.
. Epilepsy and outcome in FOXG1-related disorders. Epilepsia 2014;55:1292–1300.
. Delineation of the movement disorders associated with FOXG1 mutations. Neurology 2016;86:1794–1800.
. FOXG1 syndrome: genotype-phenotype association in 83 patients with FOXG1 variants. Genet Med 2018;20:98–108.
. Revisiting the phenotype associated with FOXG1 mutations: two novel cases of congenital Rett variant. Neurogenetics 2010;11:241–249.
. Evolutionary conservation and conversion of Foxg1 function in brain development. Dev Growth Differ 2017;59:258–269.
. RettBASE: Rett syndrome database update. Hum Mutat 2017;38:922–931.
. A FOXG1 mutation in a boy with congenital variant of Rett syndrome. Neurogenetics 2011;12:1–8.
. Somatic mosaicism for a FOXG1 mutation: diagnostic implication. Clin Genet 2014;85:589–591.
. Rett syndrome: revised diagnostic criteria and nomenclature. Ann Neurol 2010;68:944–950.
. Congenital microcephaly with a simplified gyral pattern: associated findings and their significance. AJNR Am J Neuroradiol 2011;32:1123–1129.
. Winged helix transcription factor BF-1 is essential for the development of the cerebral hemispheres. Neuron 1995;14:1141–1152.
. West syndrome associated with 14q12 duplications harboring FOXG1. Neurology 2011;76:1600–1602.
. The hyperkinetic movement disorder of FOXG1-related epileptic-dyskinetic encephalopathy. Dev Med Child Neurol 2016;58:93–97.
. FOXG1-dependent dysregulation of GABA/glutamate neuron differentiation in autism spectrum disorders. Cell 2015;162:375–390.
. 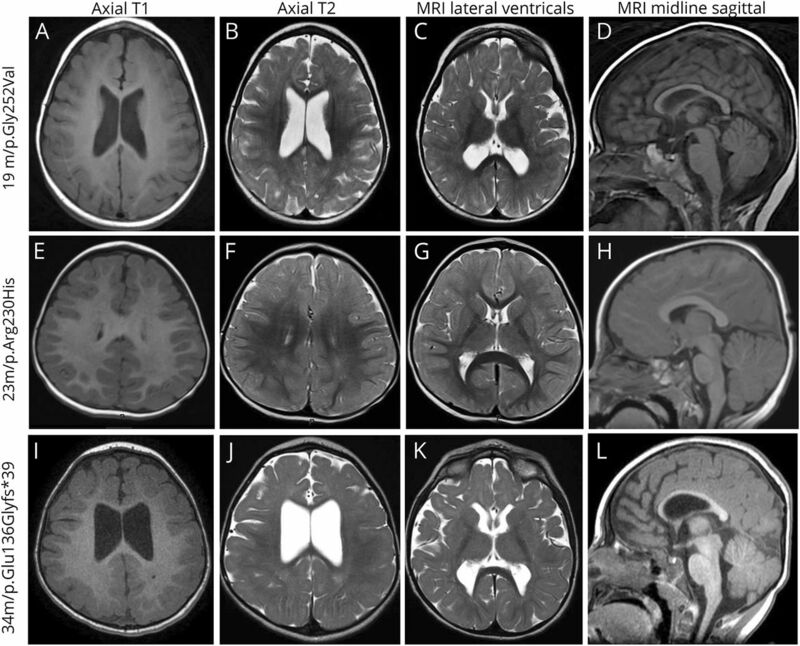 Thin genu of the corpus callosum points to mutation in FOXG1 in a child with acquired microcephaly, trigonocephaly, and intellectual developmental disorder: a case report and review of literature. Eur J Paediatr Neurol 2014;18:420–426.
. Expanding the phenotype associated with FOXG1 mutations and in vivo FoxG1 chromatin-binding dynamics. Clin Genet 2012;82:395–403.
. FOXG1-Related disorders: from clinical description to molecular genetics. Mol Syndromol 2012;2:153–163.
. Analysis of FOXG1 is highly recommended in male and female patients with Rett syndrome. Mol Syndromol 2011;1:290–293.
. Genetic disorders associated with postnatal microcephaly. Am J Med Genet C Semin Med Genet 2014;166C:140–155.
. The changing MR imaging appearance of polymicrogyria: a consequence of myelination. AJNR Am J Neuroradiol 2003;24:788–793.
. GPR56-related bilateral frontoparietal polymicrogyria: further evidence for an overlap with the cobblestone complex. Brain 2010;133:3194–3209.
. Hypomyelination versus delayed myelination. Ann Neurol 2010;68:115.
. Large national series of patients with Xq28 duplication involving MECP2: delineation of brain MRI abnormalities in 30 affected patients. Am J Med Genet A 2016;170A:116–129.
. Delineating SPTAN1 associated phenotypes: from isolated epilepsy to encephalopathy with progressive brain atrophy. Brain 2017;140:2322–2336.
. Normal postnatal development of the corpus callosum as demonstrated by MR imaging. AJNR Am J Neuroradiol 1988;9:487–491.
. Emerging monogenic complex hyperkinetic disorders. Curr Neurol Neurosci Rep 2017;17:97.
. Phenotype differentiation of FOXG1 and MECP2 disorders: a new method for characterization of developmental encephalopathies. J Pediatr 2016;178:233–240 e210.